These alternative methods have produced results in my own ventures- or those of my close colleagues- and all cost under $2,500. Note: If you are an artist, entrepreneur, or small business with insight to share- email me at meredith.elston@gmail.com. I’d love to hear what has worked to make you successful! Nothing conjures the unflattering attributes of traditional advertising better than direct mail. Think about the direct mail you’ve received this week. It’s been nothing but obnoxious political ads, car dealership hype, and a menu for the local Chinese restaurant. As a small business trying to create real, responsive relationships with customers, these make terrible role models. Wait...weren’t we looking for alternatives to traditional advertising? Direct mail has been a corporate favorite for years. We’ve been watching our grandparents and parents toss stacks of it into the trash without so much as a second glance. Why would you waste your money creating a direct mail campaign for your small business when it has such a terrible reputation? In most cases, you’d be right. However, there’s a different way of thinking about direct mail. When used with insight and smart design, direct mail actually can create genuine connections and reach the best new clients for your brand. Keeping focus on those goals- genuine connection and a narrow market- is essential to succeeding with any of the advertising methods highlighted in this series. The problem with direct mail isn’t the method, it’s how most people approach it. We spent $367 on our last direct mail campaign and have an estimated return over two years of $25,000. Those numbers seem impossible but they aren’t. It’s easy to create these numbers from a direct marketing campaign with a little extra planning and insight from you into your customer base. Any successful advertising campaign (low cost or otherwise) is going to be built on the tenants of strong branding and the focus of reaching and connecting with your best market. Think of direct mail as a way to extend use the power of gifting, which we talked about here at the start of this series. It’s a cut-and-dried way of simplifying the numbers to determine the success or failure of a campaign. The problem with this focus is that you are always chasing immediate sales. Marketing firms who encourage car dealerships, Walmart, other big box brands to use this number will do anything to get a large immediate return. They use massive discounts, disruptive in-your-face radio ads, and clip-art filled direct mail campaigns that do nothing to create long-term attraction to their brand. You’re a small business. You are relationship-focused in both brand and reach. This is why you should be using Customer Lifetime Value (CLV) when calculating risk and return in your advertising and not ROI. We set our standard on our customer base with the highest turnover: students. Most students will be in the area for 3 or 4 years, but by calculating a two year relationship we keep our estimates conservative. Again, erring on the side of caution. Our core group of customers spend, on average, $17.42/week at the shop- but we can’t assume that all of the new people we reach through direct mail are going to become core customers. It’s better to underestimate than overestimate! Using CLV instead of ROI to calculate your goals for your direct marketing campaign will not only give you a better long-term picture of how advertising affects your business, but will help you focus on the right people to reach and how to reach them. Before spending any money, you’ll want to determine who you are trying to reach. In this article, we went over how to use your best customers to determine your target market. Now that you’ve written down some characteristics of the people in your target market, narrow your focus to a specific market you want to reach by direct mail. This will help you buy the best list for your campaign. I like the ability to draw specific geographical boundaries on the map rather than using a radius focus. My focus for the 2017 DM campaign at Maeva’s was to reach students/teachers of the dental school who lived within walking distance. I wanted to initiate a relationship with people who hadn’t visited before. GeoSelector’s features allow me to focus on the residential neighborhoods where this market is more likely to be- and draw a boundary eliminating our local Walgreens, CVS, etc. Being able to set your own geographic boundaries is particularly helpful if you know your neighborhood. Other mailing services only allow you to set boundaries via radius or mailing code- which might mean you’re purchasing addresses you don’t need for your mailing. GeoSelector has options to narrow by demographic, too. This isn’t 100% accurate but it helps when purchasing a small mailing list. You can set age ranges, whether a property is rented or purchased, gender, average household income, political identity, racial identity, religious identity- as well as lifestyle choices such as whether or not they own a dog or have an interest in classic cars. Narrowing down your list to as close to your target market is the best way to stretch your dollar. Tip: Most lists specify how many times they can be used for commercial outreach. If you plan to reach the same market in that period of time, you can save money by not having to repurchase the list. A single-use license for 300 names/addresses costs $20-35 depending on the service you choose. A year-long license may be double, but worth it if you plan on quarterly outreach. Reputable list-services will guarantee a certain level of accuracy. We had a return rate of <1% on our last mailing. Also, I knew the demographic sorting was accurate when about 10% of the list were dedicated customers I could identify by name. This is pretty spooky but it does show the database is up to date. Tip: If you are already an established small business catering to a specific geographic location like Maeva’s, buy a list that is 30% larger than what you intend to use and cross reference it with the names on your POS system’s credit card sales report. By highlighting people who are already customers, you can use the same list to create two focused campaigns: one for dedicated customers and one for potential new customers. A successful design must be true to your brand and congruent with how you want to connect. Your campaign needs some sort of actionable incentive- even car dealerships know this. However, instead of some lame “see if this key unlocks your new car!” campaign that readers see right through- use this opportunity to utilize the power of gifting. One thing you should always avoid is discounting. In small business, discounting signals the opposite of what most of us want for our business. Consider offering an incentive that is both generous and welcoming rather than gimmicky. You’re already intruding on someone’s personal space and asking them to respond to a commercial request. Keep it simple, ok? No contests, no “if this then you get”s. Don’t ask them to like your social media or sign up for your mailing list. I don’t even add expiration dates on my mailings. If it takes someone a year to finally take that postcard off their fridge and bring it in for a free drink, we’re still going to be here- and we’re happy to give it to them. Remember we are growing relationships. You can’t do that with expiration dates and cheap ‘act now’ gimmicks. By affording people the chance to use our gift when they are ready we are meeting customers when the opportunity works for them. I’ve given up spending hours in Adobe Illustrator or Canva trying to create a postcard mailing that fit our image, didn’t feel sales-y, and still had the chance of attracting attention in the mailbox. The solution was so obvious that I felt like slapping myself when it hit me. My friend Jennifer sends me actual postcards wherever she travels- and I love them. The chance of getting a real piece of mail is the only thing that keeps going to the mailbox special. So why not actually send a real piece of mail? In February, I visited Peru and used photos from the trip to highlight South American coffee culture. Our goal at Maevas is to be a brand focused around exploration, particularly in central/south america. Why not use postcards from Machu Picchu? 4. To name or not to name? Mailing lists will give you first and last names associated with the address. Should you use them? It’s up to you. Personally, I think using a name can make offers confusing. In this campaign we focused on rental properties around the dental school where, yes, students are likely to rent but also where the resident is likely to change. Although adding a name is a wonderful personal touch, I usually save it for reaching out to customers I know. Not adding a specific name on the postcard makes anyone who receives it feel comfortable in redeeming it. Whatever you do, don’t skip the personal touch! I always hand-address my postcards and include at least a one-sentence note. Do you have bad handwriting? It’s no excuse. Enlist someone who has nice handwriting to take care of this for you. Our coffee shop has eight staff and addressing postcards is a great way to fill lulls in-between rushes. How Successful Is This, Really? So now you have the inside scoop on how we use direct mail for our brick-and-mortar, Maeva’s Coffee. As a small business, we use the method differently than our corporate counterparts. Does it work? Absolutely! Here are the numbers behind our September 2017 campaign. First, determining cost. I wanted to spend <$500 on an outreach to students and teachers of the dental school who live within walking distance of Maeva’s Coffee. 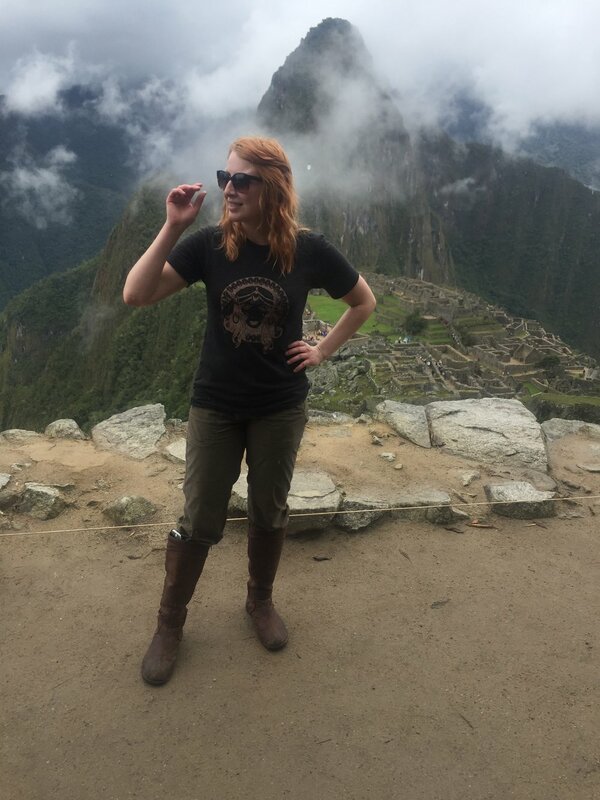 I purchased 200 classic Machu Picchu postcards for $60 and made a custom list for $24 through GeoSelector. Our postcards were oversized and cost $.49/pr to mail. Our campaign also allowed the receiver to order one free drink, any drink, no strings attached. I know that, historically, our direct mail campaigns have a <20% return rate. Just to be safe, if 30% of our cards were returned and each visitor bought our most expensive drink, it would cost us $300. We had 37 cards of 200 returned to the shop. The average cost of a drink was far less than the $5 budgeted, most visitors wanted drip coffee or simple lattes. Our total cost came in under budget at $367. Let’s calculate the success of this campaign. Since my goal was to introduce Maeva’s to new customers, I eliminated customers on the mailing list that I recognized by name. Still, there are a lot of visitors who come to Maeva’s that I don’t know by name and it’s likely some of these postcards were sent to them. People who have visited the shop before are more likely to return a postcard than a completely new visitor, so to play it safe, we’re going to estimate that 30% of the cards returned were actually existing customers who received cards. The estimate is conservative, but the results are still amazing. 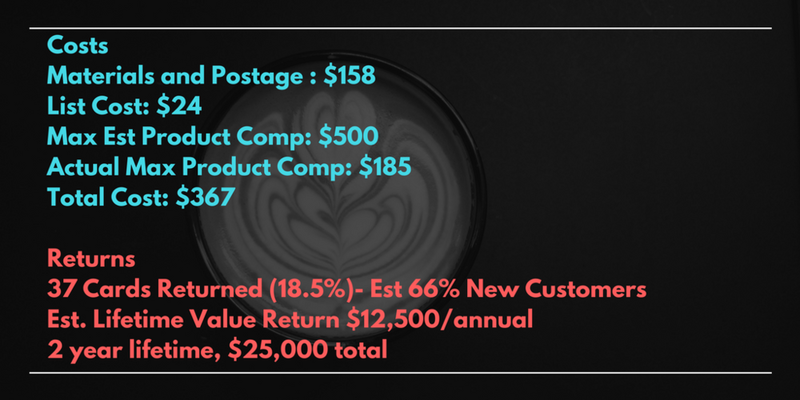 We received an 18.5% return on our direct mail campaign. According to JMW Business Services, the average return rate on direct mail is .5-2%. As a small business, when we followed good practices of targeted list making and generosity-focused, brand-building design, we substantially outperformed the big box stores. At a CLV of $500 per customer per year, our campaign will boost annual revenue $12,500 over the next twelve month and $25,000 over the lifetime of the customer. That means for every dollar we spent on this direct mail campaign, we’ll earn $68 in return. 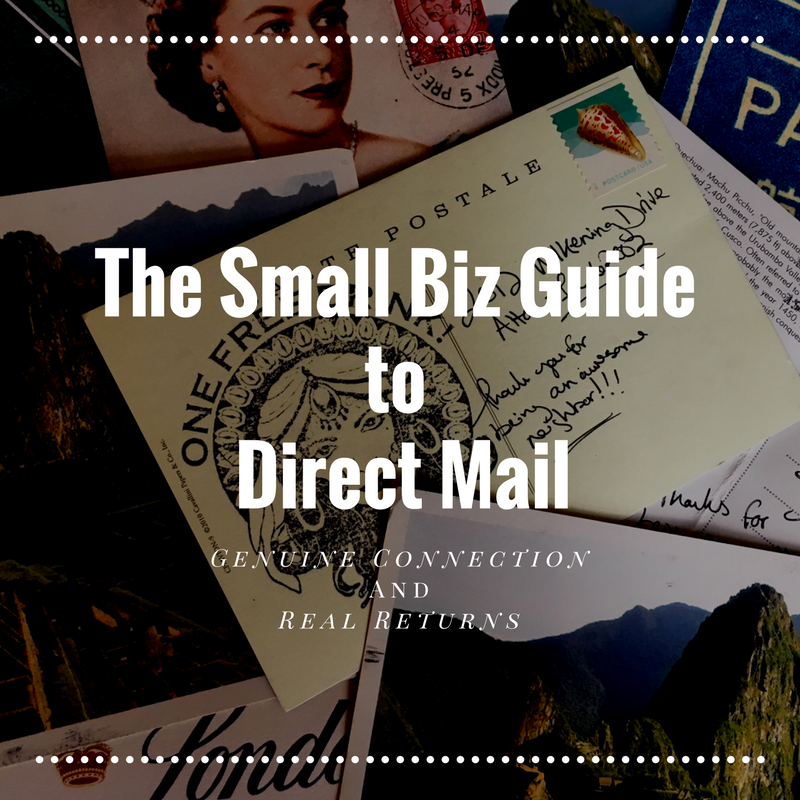 When done right, direct mail is an incredible, low-cost tool for small businesses. It can be used to reach new customers, new markets, reposition yourself in the community, or to reconnect with lost customers. All you have to do is apply thoughtfulness and commitment to your brand message. Note: Direct mail, like any form of outreach, should never make up the entirety of your strategy. It is most effective when used with other outreach methods such as collaboration, sponsorship, event outreach, and social media advertising. This article is part of a larger series on rethinking your advertising strategy as an artist, start-up, or small business. Subscribe to the RSS feed on the right or follow The Milton Schoolhouse to learn the how to use other non-traditional methods to create a successful advertising strategy for your small business.